I have been overweight most of my adult life. I love food, however all the wrong types of food or too much good food. I eat when I’m happy and when I’m sad, I eat just to eat. I definitely never exercise as I should, but always seeking quick fixes to lose weight which I never maintain for any period of time. I have been on every weight loss program there is which only works for a short period. Then I met Dr. Chhabra and her team at the Institute of Weight Loss Management. 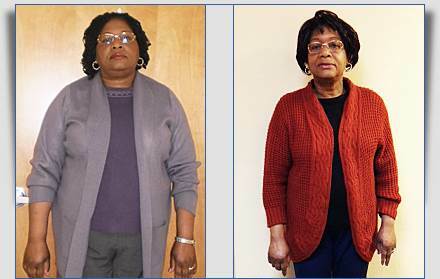 I have been at the Institute of Weight Loss Management since May 2013. In the first five months of the program, I lost 36 lbs. and have then been able to keep it off. Dr. Chhabra and her staff provide a calm supportive atmosphere without being judgmental on my occasional shortcomings. They motivate me by acknowledging my small accomplishments and provide weekly feedback on my goals. Dr. Chhabra’s one to one counselling sessions allow me to plan well balanced nutritional meals and adhere to portion control. The program helps me to learn what food works for my body type and the quantity I need to eat to lose weight successfully. Thanks to Dr. Chhabra and her entire team, I aim to achieve my ideal weight in the near future.